is a vibrant community of scholarship and learning that stands in the nation’s service and in the service of all nations. 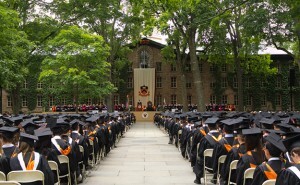 Chartered in 1746, Princeton is the fourth-oldest college in the United States. Princeton is an independent, coeducational, nondenominational institution that provides undergraduate and graduate instruction in the humanities, social sciences, natural sciences and engineering. For “the Education of Youth in the Learned Languages and in the Liberal Arts and Sciences,” the Province of New Jersey granted a charter — in the name of King George II — to the College of New Jersey. Dated Oct. 22, 1746, the charter was unique in the Colonies, for it specified that “any Person of any religious Denomination whatsoever” might attend. The College’s enrollment totaled 10 young men, who met for classes in the Reverend Jonathan Dickinson’s parlor in Elizabeth, N.J. 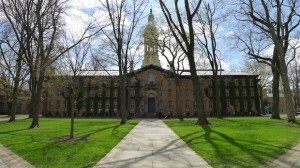 In 1756, the College moved to its new quarters, Nassau Hall, in Princeton. Nassau Hall, named to honor King William III, Prince of Orange (of the House of Nassau), was one of the largest buildings in the Colonies. For nearly half a century it housed the entire College — classrooms, dormitories, library, chapel, dining room and kitchen. During the American Revolution, it survived occupation by soldiers from both sides and today bears a cannonball scar from the Battle of Princeton (Jan. 3, 1777). The federal government recognized the historical significance of “Old Nassau” by awarding it national landmark status and by issuing an orange and black commemorative three-cent stamp in celebration of its 1956 bicentennial. In 1780, an amended charter declared that the trustees should no longer swear allegiance to the king of England, and in 1783 the Continental Congress met in Nassau Hall, thus making it the capitol of the United States for a short time. Nine Princeton alumni attended the Constitutional Convention of 1787, more than from any other American or British institution. Not surprisingly, the College’s revised charter of 1799 called for the trustees to support the new Constitution of the United States of America. As part of the sesquicentennial celebrations in 1896, the College of New Jersey changed its name to Princeton University and adopted as an informal motto “Princeton in the nation’s service,” the title of the keynote speech by Woodrow Wilson, then a faculty member. Six years later Wilson became Princeton’s 13th president. During his term of office (1902-10) plans for building the Graduate College were finalized, and what had been the College of New Jersey began to grow into a full-scale university. 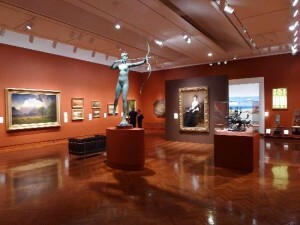 As Princeton looked toward expansion, Wilson focused on the quality of the individual teaching and learning experience. He is credited with developing small discussion classes called “preceptorials,” which to this day supplement lecture courses in the humanities and social sciences. Wilson doubled the size of the faculty, created an administrative structure and revised the curriculum to include general studies for freshmen and sophomores and concentrated study for juniors and seniors. He proposed that the undergraduate dormitories be divided into quadrangles or “colleges” in which students would live with resident faculty masters and have their own recreational facilities. A variation on this plan became a reality in 1982 when five residential colleges were organized for freshmen and sophomores. In 2007, the sixth college opened, providing new opportunities for juniors and seniors to stay integrated in an expanded and enhanced residential college system. From James Madison, Class of 1771, through Woodrow Wilson, Class of 1879, and continuing today, every Princeton student shares the tradition of educational excellence begun more than 260 years ago. The few books in the Dickinson parlor were the seeds for 70 miles of shelving and more than 7 million volumes in Firestone Library. The original quadrangle — Nassau Hall, the president’s house and two flanking halls — has grown into a 500-acre main campus with more than 180 buildings. The campus is constantly evolving — one of the newest buildings, a science library designed by Frank Gehry, opened in 2008. The “learned languages” — Latin and Greek — have been joined by many ancient and modern languages and an array of computer dialects. Today, more than 1,100 full and part-time faculty members teach at Princeton, forming a single faculty that teaches both undergraduate and graduate students. Christopher L. Eisgruber, a noted constitutional scholar, is Princeton’s 20th president. 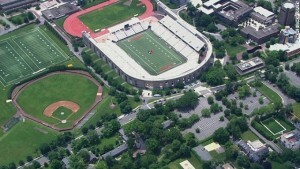 Originally an institution devoted to the education of young men, Princeton became coeducational in 1969. Today, approximately 5,200 undergraduates and 2,600 graduate students are enrolled. Virtually all undergraduates and about two-thirds of graduate students live on campus. Princeton is one of the smallest of the nation’s leading research universities. Its size permits close interaction among students and faculty members in settings ranging from introductory courses to senior theses. An interdisciplinary approach is key to the curriculum at Princeton. The quality of Princeton’s faculty is mirrored by its students, who bring with them the promise of outstanding accomplishment both in and out of the classroom. Here students will have an opportunity to learn from fellow students as well as the faculty in a setting that encourages personal growth, leadership development and long-lasting feelings of community.